VINTAGE COSTUME ESTATE ANTIQUE JEWELRY EARRINGS! 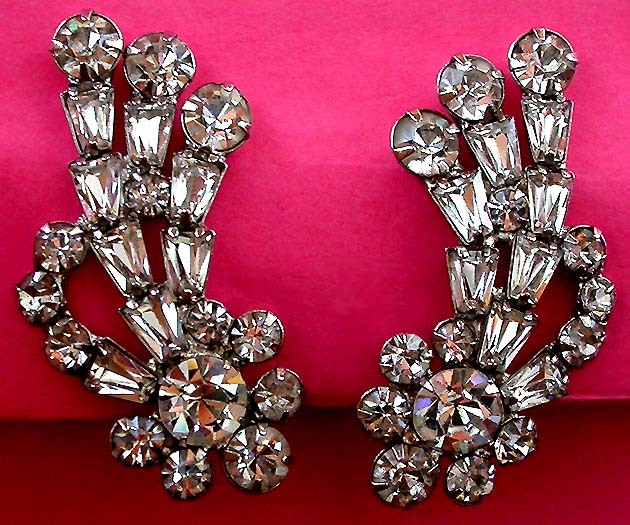 Juliana Style Clear Crystal Rhinestone Silver Tone Vintage Clip On Earrings For Weddings, Proms, Pageants And Parties! Item #E16879 - Juliana Style Clear Crystal Rhinestone Silver Tone Vintage Clip On Earrings. Size: Length: 2". Width: 1" at the widest point. The design of these fabulous Juliana style crystal rhinestone earrings is so feminine and has a lot of charm and grace. It features round and rare kite-cut crystal rhinestones. I love the spray of kite-cut stones sprouting upwards from the rhinestoned floret and the curvy rhinestoned ribbon at the side accentuating the contour of the piece. The kite-cute stones measures 1/4" each and the largest round stone measures 3/8". All the stones are brilliantly vibrant and are all prong set onto bright silver tone metal. These beautiful earrings are large and cover most of the ears. Very showy, truly breathtaking. Clip backs. Fabulous earrings for weddings, proms, parties and special functions! US$88.00. SOLD.